After you place an order, the carrier, ship date, and estimated delivery date for your package will be listed in Your Account and can be found in your shipment confirmation e-mail. If you have a tracking or delivery confirmation number, you can track your package by clicking the “Track packages” link in Your Account. Amazon also handles all customer service and product returns for “Fulfilled by Amazon” items. If you need assistance with anything, please visit our Help pages by clicking the word “Help” at the top of any page of our website. Shipped using FedEx Ground which takes up to 5 business days. Most small orders are shipped using USPS and should arrive in 2-3 business days. Larger orders will be shipped using FedEx Express or 2nd day options. Most orders are shipped using FedEx Standard Overnight and will arrive the next business day by 7:00pm. If ordered on Friday, your shipment will arrive on Monday. We can ship any way you like. From cheapest to the fastest and everywhere in between! Shipments fulfilled by BioWorld originate from zip code 93291 (hot pink zone). 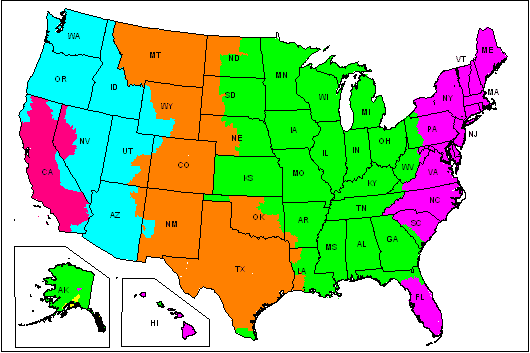 This map illustrates service schedules in business days as of August, 2010 for FedEx Ground shipments. This should give you a better estimate for your shipping options! We are located in Central California, between Fresno and Bakersfield in Tulare County. If I order overnight delivery on a Friday, will it arrive to me on Saturday? If you are a California resident, it is best to use ground shipping (if located in the pink area). Most of the time, you will receive your product the next day. If you want to ensure you receive it sooner, you can get overnight shipping. Use the link below to see if your zip code is in the 1 business day area. If your order is received before 3pm, your order will be shipped the same day. After 3pm it will be shipped the next business day. If you order late Friday afternoon or over the weekend, your order will be shipped out on Monday. Our office is closed over the weekend. BioWorld strives to give all of our customers the best customer service we can. We pride ourselves on our fast processing of orders.